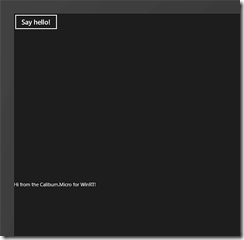 It’s happy times for the WinRT developers: Caliburn.Micro for WinRT is here. The core parts (INPC, EventAggregator) have actually been available since the developer preview was released last year, but now Nigel Sampson and Keith Patton have done a great work and have ported the rest of the framework to WinRT. Here’s a short introduction about how to get started, aimed for those who have previous experience working with the framework. Note: Caliburn.Micro is aimed to the XAML & C#-developers. It’s built as a class library so it cannot be used with C++. Update 5.12.2012:The post and the sample has been updated to work with the Caliburn.Micro version 1.4. After creating a new solution, the first thing we need is to make the Caliburn.Micro to bootstrap the application. With other supported platforms, this is usually done with a dedicated Bootstrapper-class. But with WinRT we use a custom “Application”-class to make this happen. The bootstrapper is now in place so it’s time to build the views and view models. In our bootstrapper we defined “MainPage” as the default view. The Visual Studio template already contains the MainPage so we don’t have to implement it. What is required is the view model. At this point we’re actually all set and can start adding features like we usually do with Caliburn.Micro. Our sample app still looks rather uninteresting so let’s add something simple to the view. And we’re all set. The button named “SayHello” is automatically bound against the SayHello-method and the same happens with the textbox HelloText. Caliburn.Micro has previously been easily the best framework to make you more productive when building apps for Windows Phone, Silverlight and WPF. And now we have the same powerful framework available for WinRT.